The function of joint fill is two-fold. Aesthetic and Sanitation: the joint fill on the concrete floor takes away a place for dirt to harbor. It helps the floor become easier to clean. By filling the joint, hard wheel traffic (forklifts) are smoother and damage from traffic on the floors is minimized. This joint fill process ultimately reduces the costs of damaged or broken equipment. Also, without jarring when driving a forklift or cart, there is less spilling of product. Another savings is not having broken products or replacement products. For employees, the more even surface created by the joint fill minimizes the jarring and back injuries when driving equipment in a warehouse or similar facility. This helps reduce injuries, employee time off work and workman’s comp claims. If you have an older floor, QuestMark can repair existing joints and clean and fill joints that may not have been done when the original floor was finished. We also repair old worn-out or bull-nosed joints through our joint reconstruction process. 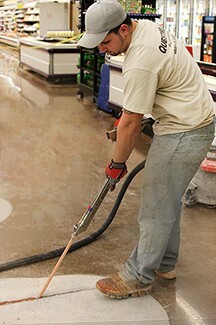 Save time and money by purchasing your maintenance and floor care products on Shop.QuestMarkFlooring.com. Once you have an online catalog account, our customer-friendly system will remember your purchasing preferences, your past order history (great for standard re-orders) and your shipping preferences. You can do all this from your mobile device - just download the Mobile Phone App. Watch the Joint Fill video!